Let’s begin with a word that isn’t in either the 1818 or the 1831 texts of Mary Shelley’s Frankenstein: robot. In fact, the word robot wasn’t coined until 1921, when it first appeared in the play R.U.R. (Rossum’s Universal Robots) by the Czech playwright, Karel Čapek. The word was actually coined by Čapek’s brother, Josef., and it comes from the Czech word robota, which means “servitude” or “forced labor.” R.U.R. is an allegorical play that depicts a company whose founder is named Rossum, from the Czech, rosum, which means “reason.” He’s discovered how to make artificial persons. His nephew realizes, afterwards, that by simplifying his uncle’s process and stripping the artificial persons of feelings and other unnecessary attributes, he can create the perfect worker, the robot. Rossum’s robots are much in demand, but eventually, predictably, they are used as mercenaries with devastating results. When the wife of the company’s director secretly has one of its scientists enable the robots to transcend some of their limitations and to develop emotions, because she feels sorry for them, disaster ensues. The robots revolt. At the conclusion of the play, all the human beings but one, a worker, are killed. The play ends when two robots, one male and one female, develop fully-fledged emotions. And it’s they who will repopulate the Earth with a new race of super beings. The term robot is thus linked, from its very inception, to the idea that technology will destroy its creators if it isn’t used properly and responsibly. The play was a big success in Prague in 1921, and it opened opened the following year in London, where it sparked debates and commentary from prominent intellectuals including George Bernard Shaw. 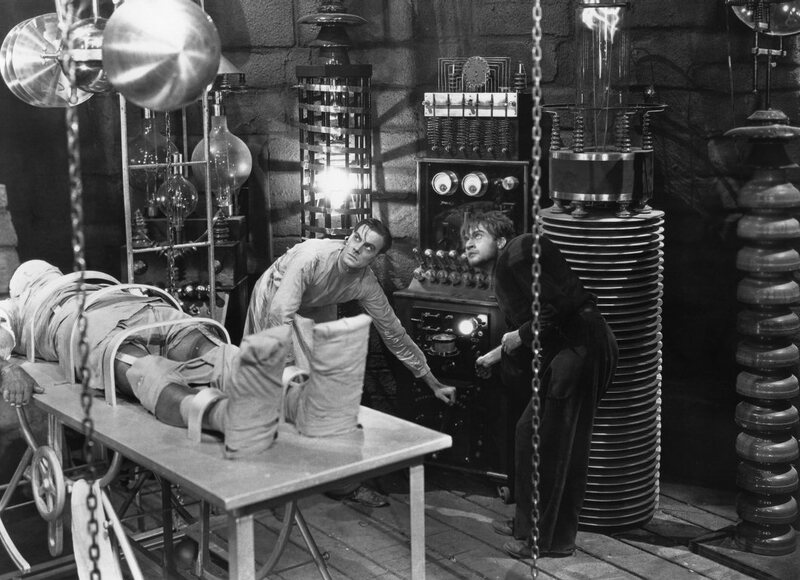 Critics quickly recognized that one of Čapek’s key sources was Mary Shelley’s novel Frankenstein, which has the subtitle, “The Modern Prometheus,” recognizing that the Prometheus myth is all about technological progress. Prometheus, we might remember, essentially creates human civilization by bringing technology from heaven to earth. That technology is called fire. Shelley made a connection between the Prometheus myth and her era’s increasing faith in scientific and technological progress. Her novel is actually very steeped in some of the latest debates about what constitutes life. It’s fascinated by the new science of animism and by experiments with electricity. Her modern Prometheus is deluded by his mastery of technology into thinking he’s a god. It’s the monster created by Boris Karloff and make-up artist Jack Pierce in the 1931 film adaptation of Frankenstein directed by James Whale. It’s this image of Frankenstein’s monster — with the flattop head and the prominent forehead scar — that has become an icon of global popular culture, rather than the creature that Shelley describes. 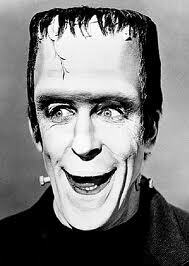 That’s right: Herman Munster, played by Fred Gwynne, in the 1960s sitcom about American suburban life called The Munsters. By the time the show premiered on television in 1964, Karloff’s Frankenstein was firmly established in American popular culture. 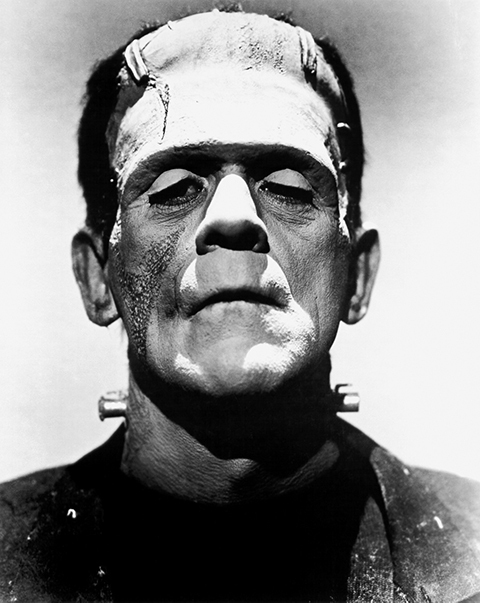 What makes Karloff’s monster so horrifying, I believe, isn’t the flat head, or the scar, or the monstrous stature, but rather the implantation of metal bolts into his neck as a result of the creation process. It’s the bolts that make him seem inhuman. Karloff’s monster is an early version of that ubiquitous what science fiction character, the cyborg. After days and nights of incredible labour and fatigue, I succeeded in discovering the cause of generation and life; nay, more, I became myself capable of bestowing animation upon lifeless matter. … What had been the study and desire of the wisest men since the creation of the world, was now within my grasp. I see by your eagerness, and the wonder and hope which your eyes express, my friend, that you expect to be informed of the secret with which I am acquainted; that cannot be: listen patiently until the end of my story, and you will easily perceive why I am reserved upon that subject. I will not lead you on, unguarded and ardent as I then was, to your destruction and infallible misery. The 1931 film adaptation isn’t so reticent about the process of bringing the monster to life. It takes some words that constitute a metaphor in Shelley’s novel — the “spark of being” — spark, and makes it literal. The dramatization of what occurs in Frankenstein’s laboratory retains not only the “spark” but the rain from Shelley’s description, but it calls attention to the role that’s played by machines, Tesla coils, lightning, and electricity. The film makes it quite clear that it’s science and technology that enables this Victor Frankenstein to become God. So if R.U.R. was influenced by Shelley’s novel, I think this film was, in turn, influenced by R.U.R. In fact, in the sequel to this film, which was called The Bride of Frankenstein, we have Victor Frankenstein saying, “I created a man. And who knows? In time, I could’ve trained him to do my will. I could have bred a race.” In other words, that Victor becomes interested in precisely the things that interest the scientists in R.U.R. Kids who pretend to be Frankenstein’s monster during Halloween tend to walk stiff-legged, with arms held out. It wasn’t Boris Karloff who gave the monster this robotic gait, however: somewhat ironically, it was Bela Lugosi. After originating the role of Dracula in Universal’s 1931 film adaptation of Bram Stoker’s novel, Lugosi had assumed that he would have the starring role in the studio’s next horror picture, but he ultimately decided that the role of the monster in Whale’s film adaptation was too limited to make sufficient use of his talents. Twelve years later, he would finally play the role in the fourth Frankenstein sequel, Frankenstein Meets the Wolfman. Blinded by a botched brain transfusion in the previous film, Lugosi’s monster walks with arms outstretched, with the same kind of stiffness seen in early film and television representations of robots (see for example Robby the Robot in the 1956 film Forbidden Planet). Universal made lots of movies about monsters: in addition to Dracula and Frankenstein’s monster, the studio gave us the Creature from the Black Lagoon, the Mummy, the Invisible Man, and the Phantom of the Opera. But that one that really took hold in American popular culture and then global popular culture was the monster with the bolts in his neck, the technological monstrosity. This image of the monster links Mary Shelley’s novel to a post-industrial-age fear of technology, to the fear of what happens when the tools that we create get out of our control. All of this leads me to a final question. If Frankenstein has been popular because of its dramatization of technophobia, why have we all recently become so obsessed with vampires and zombies? What are we afraid of now? Cyrus R. K. Patell is Associate Professor of Literature at NYU Abu Dhabi and Associate Professor of English at NYU.